The day has come: as health care exchanges open up, the government has shut down. Federal services across the country have shuttered, from the Statue of Liberty to the National Zoo’s animal webcams. In DC, a group of World War II veterans disregarded the barricades blocking off the memorial built in their honor, while some local DC eateries are offering free libations to furloughed workers. Tonight in the Crossfire: two U.S. 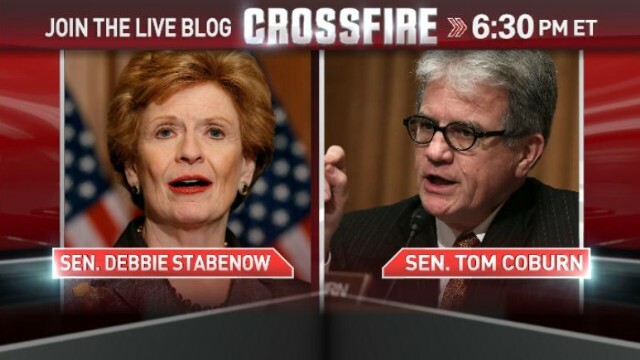 Senators, Democrat Debbie Stabenow, who supports Obamacare, and Republican Tom Coburn, who opposes the law, face off with hosts Van Jones and S.E. Cupp. We want you to weigh in. Do you think members of Congress should be paid during the government shutdown? Reply below, by responding to our tweet or commenting on our Facebook post. I definitely blame the Republicans, who always seem to be against anything Obama is for. I really think a large part of their resistance to Obamacare is their hatred of Obama, and I do believe there is a strong racist component in this hatred, at least on the part of the most conservative of the House Republicans. We should have the chance to work with Obamacare, improve it, and make it workable for so many Americans who are without health care. The House Republicans have no right to deprive federal employees of their employment, to shut down so many agencies that serve the public, and to try to stop or delay the implementation of Obamacare. No matter what some people feel about Obamacare, we cannot allow a cabal to dictate our laws, as House Republicans are trying to do right now. We could stop subsidizing the arm dealers in America by taking out provisions that most of money in our aid packages must be used to support e.g. one of Boehner's favorite lobbyist Lockheed Martin. Why would we give money to them and take away domestic programs. Billions upon Billions of dollars to American arms manufacturers through aid packages. Boehner's family bar business mostly patronized by Lockheed Martin employees and well, obviously they have jobs. If we are going to give these companies free money why not use it to develop interspace travel. There are already too many weapons in the world. Sen. Coburn's remarks about out-of-pocket expenses for insurance via the ACA are irrelevant. I have had both private and employer-sponsored health insurance. In all cases the cost of your policy was ALWAYS dependent upon what level of deductible you chose. To keep the insurance costs down self/employer always chose to increase out-of-pocket costs. The higher the deductible, the lower the insurance cost, you're gambling that you won't get a catastrophic illness. The point is, now EVERYONE has access to choices that are AFFORDABLE. We gambled and I lost my husband to cancer in 2012. He was 54 years old and had never been sick in over 26 years of marriage so we chose the low-cost option. Ironically, I'm the one that always had the health issues. Republician's hold nobody hostage. People do that to themselves. Liberal's want re-invent Soviet Union. Better look carefully. If I wanted to watch hate disguised as news I would turn on fox. I don't mind differences of opinion but I do mind liars and bigots. Until you get rid of Newt I have turned off CNN. FYI I may not agree with him but if you want to see a quality guy just look at someone like Steve Schmidt on MSNBC. That's the kind of person you need. How about US House of Representatives 2.0 . Eliminate all live people representatives and replace them with virtual representatives (VR) that would be apportioned by state population as it is now. When a bill comes up for a vote, citizens that have registered to vote would log onto to their computers and vote. In sourcing the House would eliminate several hundred potential victims of lobbying bribes, we would save the pork barreling and gerrymandering, save the salaries of the current house members, save their health care costs and that of their staffs and probably get more done to boot. The Speaker would morph into the Listener. I'd like to see "Listener" Boehner and Gingrich put this in their pipes and listen while they smoke. Really tired of the same old Washington do nothing, pocket stuffers. I think you mean you wish CNN would go back to their partisan coverage. Newt gives a bi-partisan effort. May I suggest MSNBC for what you want to hear? I just watched the Presidents speech regarding this shutdown. Republicans are holding the American people at ransom for their own personal agenda. Obamacare is based on Mitt Romneys and the republican's plan as well as the ideas of the Heritage Foundation. Republicans were elected to uphold the constitution and Obamacare was found constitutional by the Supreme Court, 42 times they tried to dismantle it and they were defeated. The majority of people approved Obamacare by re-electing President Obama, Republican's need to quit acting like little children who did not get their way. President Obama should challenge them to a compromise agreeing to delay the mandate for coverage under Obamacare if they agree to implement background checks on all new gun purchases. And thank you CNN for the hosts for tonight's program. Unfortunately I cannot watch CNN as long as Newt Gingrich is on...he lost the respect of the people by his actions when he was speaker of the house, he has no respect for other guests or co-hosts, I have to change the channel when he is on. I loved the old CNN, when it was not fighting and yelling and Republican's talking over the hosts and other guests, if I wanted to watch this type of one sided opinionated coverage I would have watched Fox New, I wish CNN would go back to their bi-partisan coverage. The most important question is – when will the president play golf again?